Quick, refrigerator dill pickle chips are the perfect thing to satisfy your snack craving! I could snack on these things all day long. These cucumber “chips” taste EXACTLY like dill pickle potato chips. 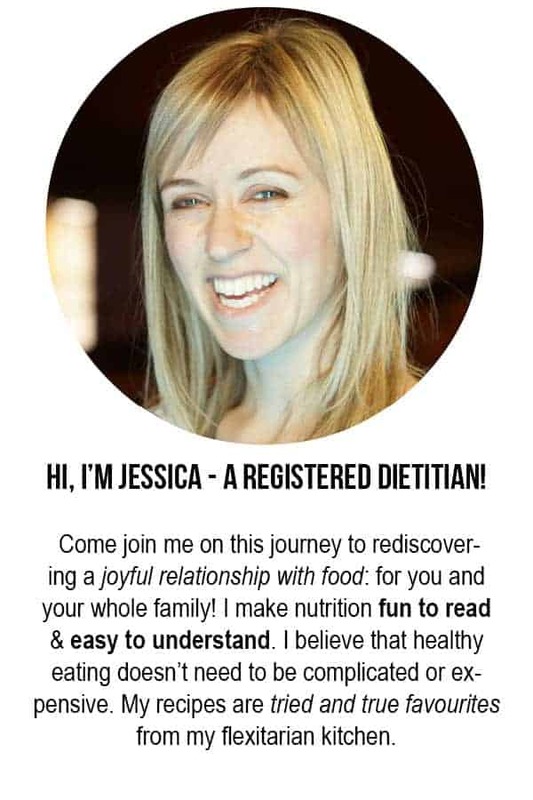 My husband says it’s a crazy dietitian thing to say but I don’t believe him. So, I need your help. Make this recipe and leave a comment saying you agree with me. and have just the right amount of bite to them! Combine the vinegar, sugar, and salt in a microwave-safe container. I use a glass measuring cup for the vinegar and add in the sugar/salt. Microwave for 1 minute. Remove and stir. If salt/sugar is not completely dissolved, microwave again for 20 seconds. 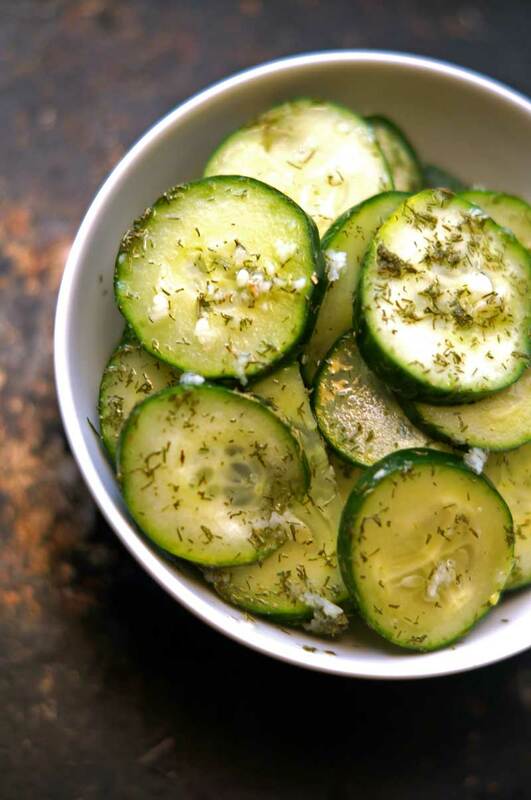 Place the sliced cucumbers, dill, and garlic in a container with a lid. Pour the vinegar brine over the cucumbers and stir to evenly coat. Keep in fridge. Eat within a couple of days. These are delicious immediately after they’re made but taste even better after 20 minutes in the fridge. I love pickles! These look like the most delicious of snacks. Thanks! They’re so EASY too. What’s not to love? Question: you don’t have to cool the brine? Thanks! You could cool first if you’d like but I haven’t found it to be necessary! I just heat it up enough to dissolve the sugar so it doesn’t get super hot. about how many cucumbers do you need for 6 cups sliced? Thanks! Depends on the size of the cucumber! 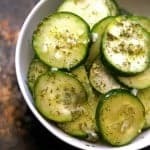 I made this recipe last summer when I had a bunch of small garden cucumbers. For store-bought cucumbers I would guess it would be about 2. I made these for my daughter and myself. Hers were gone the same day (husband and 2 boys helped), while mine were still tasty a couple of weeks later. Thanks for this super easy recipe! I’ll definitely be making again. This comment makes me so happy! Thank you for sharing. If you were near me, I’d gladly give you some of mine! I have a bunch from my garden! I discovered this recipe a number of weeks ago and decided to make them for a small family gathering. They were such a hit, that my family has placed a standing order. It seems these delicious treats have become a new staple on the family gathering table:) Thanks for the simple, foolproof and fabulous gem of a recipe! Oh wow! My heart is so warmed by this comment! I’m so happy your family loves them! Can you do this on a stove if you don’t have a microwave? Apple cider vinegar or white? My family loved these cucumber chips. Made them on Monday. This is Wednesday & he is still raving about them. By the way, after he tasted them I had to make a second batch that day! Thanks for a great recipe. Awesome! So glad your family likes them! I haven’t tried it myself but I think they would can well. You would just need to use pickling salt instead as regular table salt can make the brine go cloudy.